Tory Historian was once again taking time off and almost missed this extraordinarily witty and touching tribute in the Economist to Bill Millin, the man who piped in the D-Day landing at Sword Beach and who died on August 17, aged 88. ANY reasonable observer might have thought Bill Millin was unarmed as he jumped off the landing ramp at Sword Beach, in Normandy, on June 6th 1944. Unlike his colleagues, the pale 21-year-old held no rifle in his hands. Of course, in full Highland rig as he was, he had his trusty skean dhu, his little dirk, tucked in his right sock. But that was soon under three feet of water as he waded ashore, a weary soldier still smelling his own vomit from a night in a close boat on a choppy sea, and whose kilt in the freezing water was floating prettily round him like a ballerina’s skirt. But Mr Millin was not unarmed; far from it. He held his pipes, high over his head at first to keep them from the wet (for while whisky was said to be good for the bag, salt water wasn’t), then cradled in his arms to play. And bagpipes, by long tradition, counted as instruments of war. An English judge had said so after the Scots’ great defeat at Culloden in 1746; a piper was a fighter like the rest, and his music was his weapon. The whining skirl of the pipes had struck dread into the Germans on the Somme, who had called the kilted pipers “Ladies from Hell”. And it raised the hearts and minds of the home side, so much so that when Mr Millin played on June 5th, as the troops left for France past the Isle of Wight and he was standing on the bowsprit just about keeping his balance above the waves getting rougher, the wild cheers of the crowd drowned out the sound of his pipes even to himself. 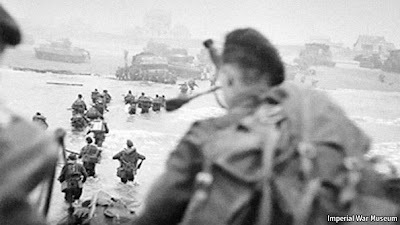 And so Mr Millin piped through that terrible advance and into Normandy. Three times therefore he walked up and down at the edge of the sea. He remembered the sand shaking under his feet from mortar fire and the dead bodies rolling in the surf, against his legs. For the rest of the day, whenever required, he played. He piped the advancing troops along the raised road by the Caen canal, seeing the flashes from the rifle of a sniper about 100 yards ahead, noticing only after a minute or so that everyone behind him had hit the deck in the dust. When Lovat had dispatched the sniper, he struck up again. He led the company down the main street of Bénouville playing “Blue Bonnets over the Border”, refusing to run when the commander of 6 Commando urged him to; pipers walked as they played. He took them across two bridges, one (later renamed the Pegasus Bridge) ringing and banging as shrapnel hit the metal sides, one merely with railings which bullets whistled through: “the longest bridge I ever piped across.” Those two crossings marked their successful rendezvous with the troops who had preceded them. All the way, he learned later, German snipers had had him in their sights but, out of pity for this madman, had not fired. That was their story. Mr Millin himself knew he wasn’t going to die. Piping was too enjoyable, as he had discovered in the Boys’ Brigade band and all through his short army career. And piping protected him. In the comments to the article there is information about a projected memorial to Billy Millin and his bagpipes at Pegasus Bridge. Tory Historian was enthralled by the story of the marine who first served in the Anglo-Sudan war, went on to the Western Front in the First World War, retired but felt he could not live without serving his country so he spent 18 months in the Royal Irish Constabulary. At the outbreak of World War Two in 1939 he volunteered for service aged 64 and was commissioned and made responsible for security at the Admiralty. He won the Defence Medal and War Medal and in 1945 he resigned his commission shortly before his 70th birthday. He died at his Suffolk home in 1968 aged 93. All this was established from his medals and various documents that were discovered during a house clearance. Here is an interesting quote from an article Noel Skelton published in the Spectator on May 3, 1924, entitled Private Property: A Unionist Ideal. It follows that the extent of the distribution of private property is the measure, on its economic side, of a civilization's stability and success. Similarly, character and a sense of responsibility are rooted in a man's possession of 'something of his own'. A democracy withoug scope for the development of economic character and responsibility, cut off from private ownership, cannot be expected to understand the material foundations of civilization. This is the exact opposite of the idea that reliance must be put on the state and property should be held by it in the people's name and for the people's good. A delightful collection of colour photographs taken in Russia in the early twentieth century by the chemist and photographer Sergey Prokudin-Gorsky, who had made numerous innovations in photography and started a systematic photographic documentary of the Russian Empire. About half of the photographs and plates were confiscated by the authorities when Prokudin-Gorsky left the Russia in 1918 to settle eventually in France where he continued his work. The remaining half is now in the Library of Congress. Here are some more of the images. There are so many and they are so fascinating that choosing one seems impossible. Tory Historian has, once again, been out of action and, therefore, a few dates have not been noted. August 21 was the anniversary of the birth of the last Hanoverian king, William IV and August 22 was the anniversary of the death, in battle, of the last Plantagenet King, Richard III. Tory Historian seems to have written about him several times (far too often some readers might say). Here is the link to all the postings on the subject. August 24 marks the anniversary of the birth in 1724 of George Stubbs, whose wonderful "Whistlejacket" can be seen above. Above all, however, August 24 is the seventieth anniversary of the first German bomb dropped on the City of London. It was not the beginning of the Blitz - that came later - and the bomb was probably not aimed at the City but at some aircraft factories in South London. Still, this occasioned a highly popular (in England) return raid on Berlin in which 10 people were killed. The general feeling was that a bombing war was going to happen, no matter what, and there was no real need to worry about it. This opinion was to change during the Blitz as the full horror of it developed. The death of Sir Robert Peel was an event so sudden, so unexpected, and so distressing that it excited a universal feeling of sympathy in the British heart, and stilled for a season every voice but that of melancholy among the immense multitudes to whom his public career had made him known. It stifled, during the first paroxysm of grief, even the loud wail of national distress: it obliterated the deep lines of party distinction: it caused to be forgotten the most painful feelings of extinguished confidence. All classes hastened to pay tribute to the eminent statesman who lay extended on the bed of premature death ... But there is a time for all things. There is a time for sorrow, and there is a time for justice. There is a season for sympathy with the agonised hearts of mourning relaties, and there is a season for calm reflection on the acts of public men. Death at once renders them the province of history. As to how long the gap between the sympathy and the calm reflection ought to be is hard to judge. Indeed, we have no clear views on it and never have had. Much depends on the attitude one takes to the particular public figure. This comes from David Torrance's Noel Skelton and the Property-Owning Democracy and concerns the founding of the 1922 Committee and the death of a coalition. The Carlton Club meeting of 1922 was integral to the development of the Conservative Party as a more democratic organisation, and to a country struggling to come to terms with the realities of the post-war era. A revolt by a group of junior ministers was the first hint that something was afoot, and in October backbench Conservatives decided to overthrow their leader, Austen Chamberlain, and withdraw from the coalition. Following speeches from Andrew Bonar Law, a Canadian Scot, and Stanley Baldwin, a half-Scots laird who affected a 'man of the people' image, MPs voted 185 to 85 in favour of discontinuing the six-year coalition and filed out of the Pall Mall club to face the consequences. It triggered an immediate general election and marked, in effect, the beginning of modern British politics. One has to admit that several events are described as marking the beginning of modern British politics so one need to take them with a pinch of salt. Nevertheless, there is some truth in it. 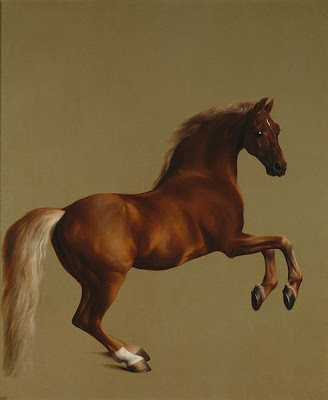 The 1922 Committee, a new institution has survived to this day and has been impossible to destroy by the party leadership. The subsequent election led to a short-lived Conservative victory but laid down the ground for a long ascendancy by the party in Parliament and its reputation for adaptability to whatever new conditions arose. Curiously enough, members of the dying coalition had assumed that it was they who would be the symbol of the new post- World War I politics and of the new world that had emerged from the war and the peace treaties of 1919 and 1920, not to mention the creation of the Irish Free State in 1922. How wrong they were. This was not just the end of that particular coalition but the beginning of the death throes for the Liberal Party. World War II ends definitively with Japanese surrender. On August 15 the Emperor broadcast to the people of Japan announcing this fact. Some Japanese soldiers and officers, shocked by the surrender and by the actual fact of the Emperor's broadcast, committed suicide. It was later established that the execution of Allied POWs continued for some time. Actual Instruments of Surrender were not signed by the Foreign Minister Mamoru Shigimetsu till September 2 on board SS Missouri but sixty-five years ago this day the war ended. The Conservative History Group wants to publish the next issue of the Conservative History Journal at the end of November. So, here is your chance to contribute an article on any aspect of conservative history - not just the party or the politicians but other topics; not just in Britain but in other countries. The glory of being a published author awaits you. 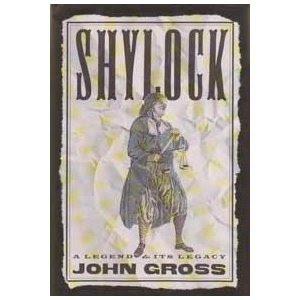 Between them, Antonio and Shylock represent two extreme versions of Economic Man, one benevolent, the other malign. Jekyll-Antonio embodies the fantasy that you can enjoy the benefits of economic enterprise and confer them on your society, without being competitive and self-assertive. Hyde-Shylock is the capitalist as total predator conferring good on no one except himself. They are twin aspects of the same phenomenon; and a tremendous amount of the play's energy is pent on keeping them apart. Antonio is the merchant of the title who has trading interests all over the world and is known for lending money without interest, which annoys Shylock for the very good reason that it undercuts his own business and that of people like him. Theoretically, lending without interest was the correct Christian attitude but, in practice, that never happened and, though there was a myth that only Jews were usurers, anyone who knows the littlest bit of Italian and, indeed, English history, knows that to be untrue. Indeed, by 1571 English law lifted even the theoretical ban on usury though interest of over 10 per cent could not be charged. In 1625 Francis Bacon wrote his essay Of Usury, which justified the practice but in the 1590s when The Merchant of Venice was probably written and 1605 when it seems to have been first performed, usury was still seen as something wicked despite its widespread existence in society. Indeed, wealthy Elizabethan England could not have prospered or, even, survived without credit, money lending and interest. The dichotomy of the importance of wealth but the nastiness of wealth making has survived in English literature (and, frequently, in English public attitude). Dickens, as George Orwell, for one, has pointed out, wrote about all sorts of benevolent rich gentlemen who, apparently neither earned nor made money but somehow acquired it in order to do good with it. Antonio can lend money with no interest only when he has it as the play makes it clear but as is not so obvious, he presumably gets it by astute trading and hard bargaining. He may not do it personally but his agents all over the world must have done. The play does not have a happy ending, despite being a romantic comedy. Shylock is forced to settle his money on Jessica and Lorenzo and to become a Christian, which clearly hurts him beyond anything; the aristocratic wastrel and profligate Bassanio marries Portia and gets his hands on her wealth. Tory Historian's suspicion is that within a couple of years that happy couple will be borrowing money, if not from Antonio then from Shylock, in order to keep Belmont going. 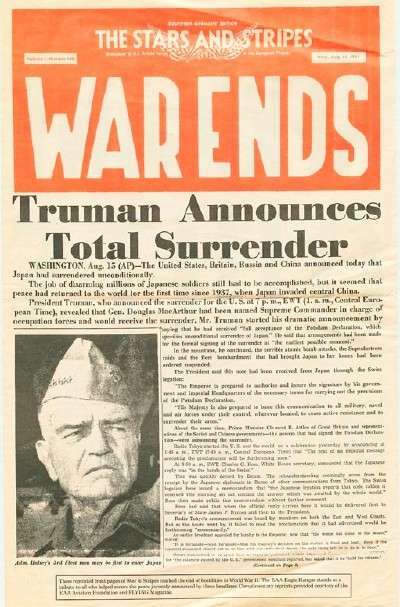 From the USS Augusta, in mid-Atlantic President Harry S Truman announced the dropping of the first atomic bomb on Hiroshima. 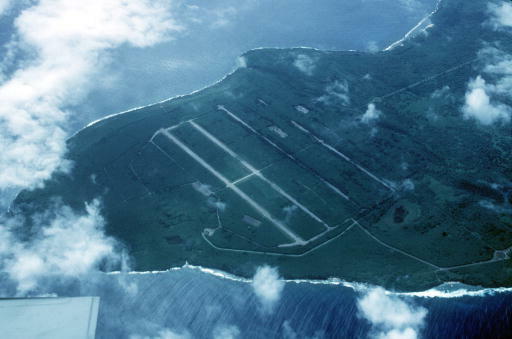 It was dropped from an American B-29 Superfortress, known as Enola Gray. The second picture, from DefenseImagery.mil and reprinted with their permission, shows an aerial view of the USAAF North Field on Tinian Island from which B-29 bombers flew throughout World War II. 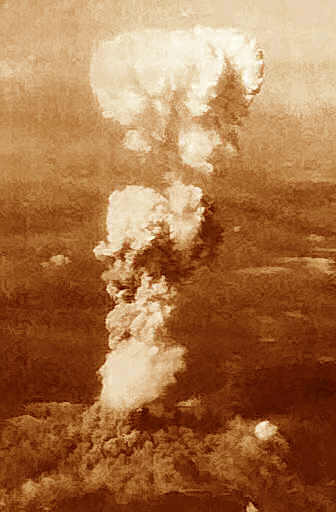 That included the two that flew to Hiroshima and Nagasaki. 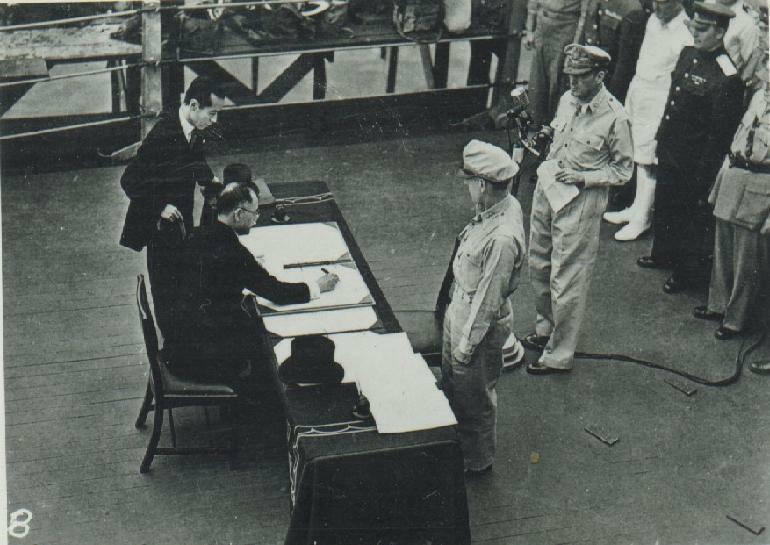 The two bombs undoubtedly brought the war in the Pacific to a much speedier conclusion and inaugurated a completely new age in military thinking and international affairs. In a 1933 speech Buchan said he "believed in a property-owning democracy. Unless a man owned a certain amount of property he could not have real freedom. The vital task before a civilized state was not to do things for a man, but to put him in a position to do things for himself". This theme continues to resonate both in Britain and developing countries where, it has now been accepted by many people, though not by governments or NGOs, nothing will improve until the idea of property becomes a strong basis of economic life.